Coach Joe is gearing up to defend his title as the Second Best 85 KG Weightlifter in the Country who is between the age of 35-39 and 364 days. Joe walks through some simple steps he takes to ready himself for the competition so you can take to ready yourself for your priority competition. 1 - Understand the difference between training and competing. 2 - Take steps to control your behavior. 3 - Practice adapting to different environments. 4 - Learn to calm the commotion. 5 - Adjust your programming. 6 - Mimic the competition setting. Gang, along with this great content and tips to get you ready for your next competition Coach Joe sets some cool reminders and looks forward to future content. 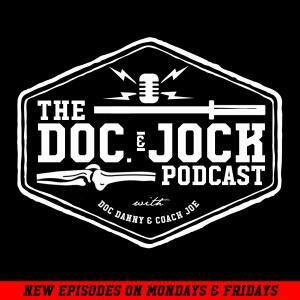 Be sure to check out www.docandjock.com for our FREE 30 Mobility Challenge. Head over to Train Heroic Marketplace (https://marketplace.trainheroic.com/#/org/DocandJock) and check out our Durability Training Plan. Enter the code DURABLE at checkout and get 70% off. A $100 Gift Card to Whole Foods so you can implement your InsideTracker recommendations right away! Look out for links, and material to get your name in the hat for this killer giveaway.